Champagne diamonds are a stunning choice if you desire a unique, beautifully colored stone. The brown and yellow tint offers an engagement ring a distinct and appealing look. 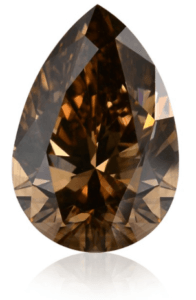 While some prefer a darker stone like this fancy dark orangey brown diamond, others enjoy a lighter shade, like this fancy light brownish stone. When selecting a champagne diamond, you want to consider its color along with its cut quality. These two components impact the beauty more than anything else. Above all, we recommend purchasing a champagne diamond from a trustworthy seller who offers high-quality photos, like James Allen or Blue Nile. Be sure to review each individual diamond closely before making your selection. If you want help in finding the best champagne diamond for your budget and taste, email our experts. Champagne diamonds are colored diamonds that are naturally brown with a yellow tint. They range in hue from light brown to darker shades—resembling the color of champagne. These fancy brown diamonds, like other colored diamonds, make for stunning engagement rings and other champagne diamond jewelry. Their eye-catching color enhances unique pieces that offer plenty of personality. These diamonds gain their color from traces of other elements in the crystal’s structure. Champagne diamonds contain small amounts of nitrogen trapped during diamond formation. The higher the nitrogen content, the deeper the intensity of the brown color. Some champagne diamonds are referred to as cognac diamonds or chocolate diamonds. While colorless diamonds typically lose their value with increased tint, champagne stones are sought out for their beautiful, natural coloring. Where Do Champagne Diamonds Come From? Champagne diamonds are formed and mined in various parts of the world, including Australia, Siberia and Africa. The largest champagne diamond mine is the Argyle Diamond Mine in Western Australia, where other colored diamonds are mined as well, including pink diamonds. Over the course of billions of years, champagne diamonds are formed with traces of nitrogen in the crystal, causing their signature color. The compression and heat involved also contribute to the formation of these unique gemstones. Like white diamonds, champagne diamonds rank a 10 on the Mohs Scale of Hardness, making them the most durable stones in the world. Champagne diamond jewelry, therefore, is incredibly resilient and great for everyday wear. How Rare is a Champagne Diamond? You may be wondering if a colored diamond, specifically a champagne, is rarer and more expensive than a white, colorless diamond. 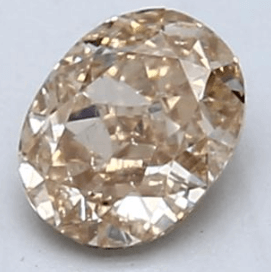 In general, champagne colored diamonds are less rare than colorless diamonds and other fancy colored diamonds. Therefore, the prices of champagne diamonds are significantly less than these diamonds as well. Popular fancy diamonds, like the yellow canary diamond, are more expensive than brown and champagne diamonds. The price of a champagne stone depends on its carat weight, the intensity of color and its clarity. For example, this yellowish brown 1 Carat diamond costs $4,110, while this darker brown 1.38 Carat Princess Cut stone costs $5,070. Fancy champagne diamonds with no overtones are rarer than those with secondary tints. For example, a famous 69.93 carat champagne diamond called the Golden Pelican is estimated to be valued at $3 million dollars. The Golden Jubilee, another famous champagne diamond presented to the King of Thailand in 1997, weighs 545.67 carats and carries an estimated value between $5-12 million dollars. As champagne colored diamonds continue to increase in popularity, their prices also increase. However, a wide selection of champagne diamonds remains available at reasonable and competitive prices. Like other fancy diamonds, the price of a champagne diamond hinges primarily on its color intensity, carat weight and cut quality. In general, though, the deeper the color, the higher the price tag. The beauty and value of champagne diamonds varies greatly, just as with colorless diamonds. The main features to consider are the Color, Cut, Clarity, Carat Weight and Shape. We recommend choosing a champagne diamond that comes with a gemological certificate from the GIA or AGS, so you have lab verification of the stone’s features and qualities. As with all fancy diamonds, the intensity and shade of color indicate how beautiful and expensive a stone is. 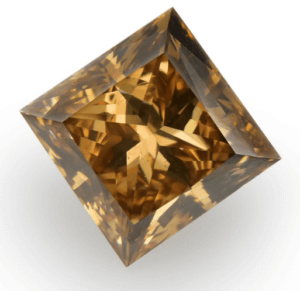 Champagne diamonds range in color from light to dark brown and often carry a secondary hue like orange or yellow. While color preference is based on the individual wearer, the richer the hue, the rarer and more expensive the stone is. Taking into account these three features, champagne diamonds are graded for color quality. The Argyle Mine carries its own grading system for champagne stones, while the GIA and AGS utilize a different scale. If your diamond is graded by the GIA (which we recommend), the scale will look different. The GIA doesn’t use the word “champagne” on a grading report. The color might be described as brown, fancy dark brown, fancy yellowish brown or a similar phrase. Because it can be difficult to assess a champagne diamond’s quality, we recommend you reach out to our experts for a second opinion. It’s better to catch a poor purchase before it’s too late. A diamond’s Cut impacts how much brilliance and fire the stone gives off. In other words, it affects how sparkly the diamond is. The better the cut, the more beauty and, typically, the higher the price. With champagne colored stones, there aren’t standardized cut options like there are with colorless diamonds. For example, you can opt for an “ideal” cut with a white diamond, but not with a champagne one. Ultimately, it’s up to the diamond cutter to maximize the individual diamond for its unique combination of color, clarity and brilliance. In darker champagne stones, brilliance plays less of a role because white light reflection is less visible. With these diamonds, it’s important to consider how the cut impacts the color intensity. If the cut makes the diamond appear richer in hue, then it’s a more desirable cut. On the flip side, a poorly cut champagne diamond may appear uneven in its coloring or may present no brilliance or sparkle—ultimately leaving the stone dull and lifeless. A diamond’s clarity denotes how clear it is of blemishes and inclusions. The fewer the flaws, the more beautiful and valuable the stone is. When evaluating clarity, we recommend looking for an eye-clean diamond. In other words, to the naked eye, blemishes and inclusions should not be noticeable. It’s often difficult to find a champagne diamond on the lower end of this scale. Many champagne diamonds have a clarity grading in the range of SI1-I2. You can, however, find some reasonably priced champagne diamonds in the VS (Very Small Inclusions) range. So while it’s hard to find a champagne diamond without any imperfections, you still want to aim for a diamond that doesn’t have any glaring or distracting inclusions and blemishes. A diamond’s Carat refers to its weight. A 1 Carat diamond is equal to 200 milligrams or 0.2 grams. For perspective, a 1 Carat Diamond weighs roughly the same as a quarter of a raisin. When choosing a champagne diamond, we recommend spending more of your budget in the areas of Color and Cut. These qualities impact the beauty of champagne diamonds more than any other feature. A heavier or larger looking stone isn’t necessarily more beautiful. For example, it’s better to purchase an exquisite 1.47 Carat champagne diamond than a lifeless 3.09 Carat champagne stone. Diamonds can be cut in a variety of shapes. Which shape you prefer is completely up to personal preference. Most importantly, choose a shape that matches the style and personality of the wearer. Champagne diamonds can be found in anything from Emerald and Oval Shapes to Round and Cushion Cuts. Throughout our years of experience in the diamond industry, we’ve vetted several diamond dealers—both online and bricks and mortar stores. With our consistent pulse on the market, we know which companies you can trust and which ones to avoid. To ensure you purchase a high-quality champagne diamond at an excellent price, we recommend the following vendors. If you’d like help in choosing the most beautiful champagne diamond for your budget, just email our experts. Champagne engagement rings are growing in popularity, as many celebrities like Jennifer Lopez and Halle Berry proudly show off these unique rings. To design an extraordinary champagne engagement ring, we recommend focusing first on finding the right diamond. From there, you can design your ring with any type of setting and precious metal. Want help in finding the most stunning champagne diamond for your budget? Contact our experts.